I know it’s not exactly fall anymore, but I didn’t have my waffle iron back in the fall so I am making pumpkin spiced waffles now. 🙂 Since we got the waffle iron, waffles have become a weekend tradition. My daughter Meadow seems to just love them. I have made Blueberry Oatmeal Waffles and Strawberry Banana Waffles in the past. 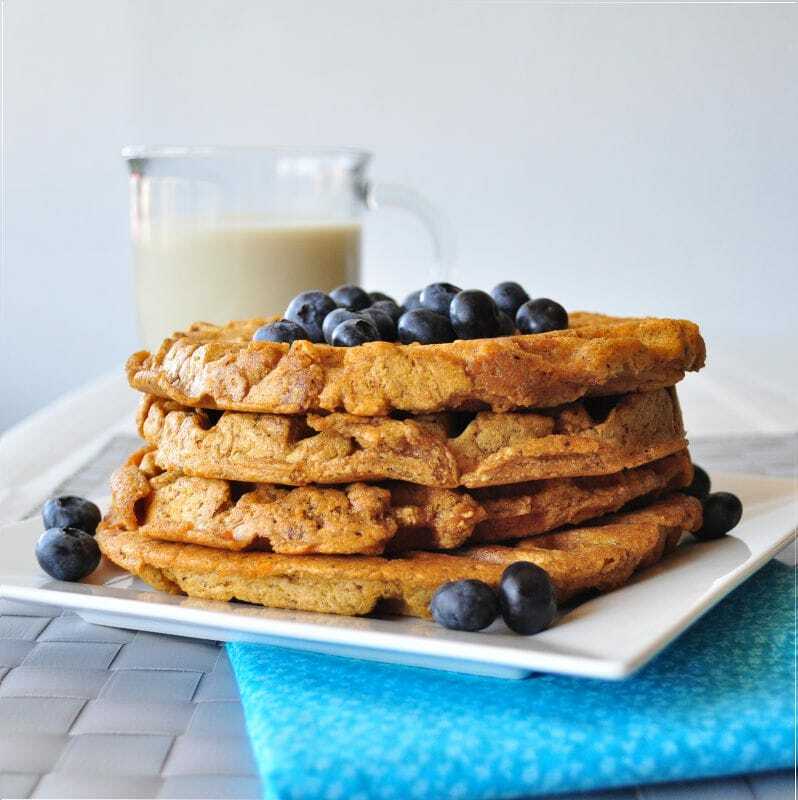 This week I made these pumpkin spiced waffles and they were a hit! Recently, in my quest to learn all about flours, I learned that there is such a thing as white whole wheat and that it is actually a whole grain. So I bought a bag and made these with it. I think they turned out much fluffier than waffles made with whole wheat. I can’t wait to experiment more with it. I find it works well to mix all the dry ingredients the night before so these can be made quickly in the morning for my hungry three year old. Turn on the waffle iron and let it heat up. In another bowl mix wet. Add wet to dry being careful not to over-mix. Scoop out about 1/2 cup size batter and spread onto a greased waffle iron. I greased my waffle iron with walnut oil, but coconut oil will work well too. I got about 5-6 big waffles out of this recipe. You can freeze the extras if you have any. Just place a sheet of parchment paper in between each one. Easy peasy. Hi! I just found your site the other day and absolutely love it! I'm assuming but want to double check that you are using a 15 oz can of pumpkin for this recipe, right? Thanks! So glad you like the blog. :) I did use a 15oz can of organic pumpkin. The can was BPA free too. I usually grind winter white whole wheat for our bread; it makes a much lighter loaf than the usual red winter wheat. Sometimes I even use it in goodies I make for others, and they don't ever seem to notice that it's whole wheat! I am going to try your recipe for pumpkin waffles on Monday. They look soooo yummy! Hope you like them. I have often thought about grinding my own wheat. what is the brand name of the pumpkin you used and where is it available? I used Sprout's brand organic pumpkin mix. Whole Foods sells one too. What sort of Waffle Iron do you use? any recommendations out there? Waffle Sticks?!?!?!? awesome!!! Thanks for the quick reply!! cheap and good is always a bonus in my Book!!! Any substitutes for coconut sugar? I want to make them for breakfast and that is the only ingredient we don't have. Yes, you can use another sweetener if you like. Can I use spelt flour instead of the whole wheat flour. Best Christmas breakfast ever! Added mini chips and topped with chopped walnuts, fresh whip and sliced strawberries. I also got 12 waffles from the recipe and I can't wait to eat the leftovers. Would it be possible to make these gluten free? Oat flour? I got a waffle maker for Christmas and I would really like to try these! Thanks, Melissa! I will try this recipe soon. We recently got a Hamilton Beach waffle maker with removable grids for washing. We love that feature, plus it makes great waffles! Awesome! I hope you enjoy my recipe. I wish mine had removable grids! These are so good. Seriously so good. Better than "unhealthy" pumpkin waffles that we love. Thank you for this recipe. You are so welcome Melanie!